The settlement is situated 21 km southwest of Odorheiu Secuiesc (Hu: Székelyudvarhely), in the valley of the Nagy- or Lok stream, lying among high hills. 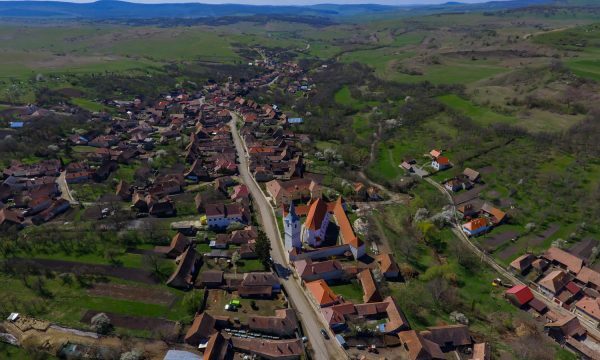 According to scholars the name of the village is derived from the slavish person name Drž, and is first mentioned by written sources in 1334 as Ders. According to tradition, the old village was located originally at the Pénzes field, which was burned to the ground during the Mongol invasion. Oral tradition claims that today’s population came from Daróc, and the church was originally built by Saxons who lived here, before the settlers from Daróc arrived. The Unitarian church of the settlement was built in two phases: the 13th–14th centuries and in the 15th–16th centuries. Later, in the 16th–17th centuries the church was fortified. The Gothic style church structure is believed to belong to the 1490s, given that in 1460 there was a siege and part of the church was demolished. The gate tower was burned down, and rebuilt much later, in 1606. According to an account of Balázs Orbán the medieval church “… is one of the more pretty churches, in the line of the Gothic style church buildings …”. Looking for accomodation around Dârjiu? Click the button below, and you can find a suitable place in just a few minutes.